Outsourcing has evolved beyond being viewed as a purely tactical exercise to reduce costs and increase operational efficiencies. Businesses today are using it to achieve their enterprise-wide strategic goals and focus on core competencies. Strategic outsourcing services can range from Application Development and Maintenance (ADM) to business process outsourcing to setting up turnkey IT centers on a BOT model (Build-Operate-Transfer), to business re-engineering. Outsource2india, headquartered in Bangalore, specializes in the delivery of a range of outsourcing solutions across several industry verticals. Our unique 5-stage outsourcing process and investments in cutting edge infrastructure at O2I have helped Outsource2india to stay ahead of the competition. Outsource your services to O2I and give your organization a competitive edge. Flexible execution models: A selection of onsite, offsite, onsite/offsite-offshore, or nearshore business models allow flexibility in the execution and delivery of strategic outsourced services. This model provides specialized resources, cost flexibility and satisfies short-term time-to-market demands. This model is suitable for short-term business needs, to fill skill gaps. However the integration of different out-tasked outcomes may not be a seamless one. Vendors and clients share risks and rewards through this collaborative model. This model has high client benefits as it holds the vendor accountable for an entire project, and allows the application of industry best practices in the outsourcing process. On the other hand, working from project-to-project is a piecemeal approach to outsourcing. A more consolidated view of the outsourcing initiative is required, within a unified governance framework. This is provided by the multi-year managed services model. This model fosters the development of long-term, multi-year, SLA-based relationships to provide integrated solutions across the enterprise. The service provider takes responsibility and accountability for agreed- upon strategic business outcomes. Projects typically have a large scope and scale and the knowledge gained by the vendor is invested back into the system so that the client's benefits increase year on year. These partnerships allow the sharing of risks and rewards, encourage innovation, embrace business change and contribute significantly to the strategic goals of both partners. Making complex decisions to obtain desired business outcomes requires a high level of sourcing maturity. It involves an understanding of factors that influence who should outsource, to whom, why, where and when. The managed services model has become central to the business strategy of many companies and could be a key driver of global competitiveness. Outsource2india delivers world-class solutions in a range of services that include Data Entry Services, Engineering Services, Healthcare BPO, Finance and Accounting Services, Software Development, Research and Analysis Services, Photo Editing Services, Creative Design, Web-analytics and more. 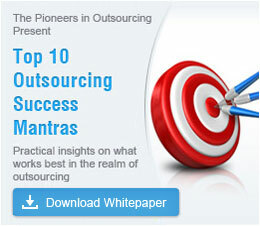 Contact Outsource2india here for any of your outsourcing requirements.